The Elainer Waterproof Mattress Protector is made from 80% Cotton & 20% Polyester. 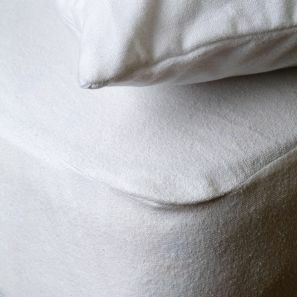 The Terrytowelling Cover has a Hydrophilic layer that does not allow any liquid into the mattress. Micropores allow the air to flow through and it is fitted extra deep at the sides. Anti-bacterial and anti-allergenic giving complete protection against mites. It prevents the spread of bed smells from perspiration. It is washable at 90C and is white in color.